When your car makes a weird noise or when your check engine light comes on, do you tend to ignore it for a long period of time or do you take immediate action and drive by your car repair shop to get it checked out? Today, while going to a networking event, I noticed a worried looking lady in the parking lot standing outside of her car waiting. I asked her whether everything was okay and she said, “No, not at all. My car doesn’t start anymore and I am waiting now for a friend to pick me up.” I asked her whether she thinks it is the battery and I could give her a boost. She said that for the last few weeks her car made this weird noise during the starting phase and she always told herself that one day she would get it checked out but she never did and now the car won’t start anymore. It happens in life and it happens in the workplace. There are a lot of people who ignore the signs of their environment and they come up with reasons and excuses why they can’t attend to the signs but they will when they have time. Examples of these signs can include disagreements with a business partner that are left unaddressed but they are palpable in the room or increased absenteeism or turnover in a department. And if we look into the personal life we can find examples of people who are overweight and neglect their health until … they go to the doctor and the doctor diagnoses them with an autoimmune or another irreversible dis-ease. There are a lot of people who will not take action and are willing to change and grow until the problems in business and life are so big that the pain of change is smaller than the pain of the situation that they are in. And then there are other people who like to stay ahead of the problems and major drama in life and they know that their mindset, their personal growth and their commitment to their personal growth will give them the advantage to resolve issues and problems as soon as they appear. In what camp are you? Do you tend to wait and do you get a lot of energy from drama and problems but at the same time find it very draining and exhausting? Or are you someone who knows that major problems can be reduced or avoided altogether when you stay committed to your personal development? 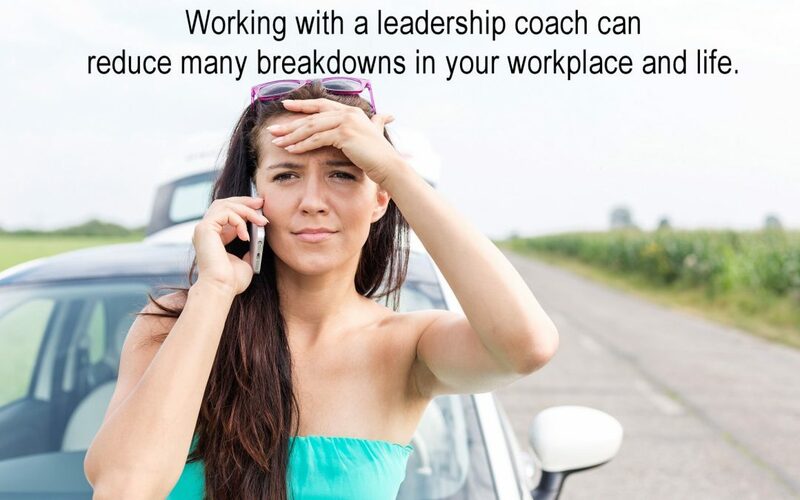 As a leadership coach, I work with business owners, managers, and executives from both camps; those who are chased by problems and those who like to stay ahead of them. Most people will engage with a coach when the problems they experience become unbearable which results that they will also spend more time and money in order to pull themselves out of it. Ideally, you want to avoid this because it will save you a lot of grief, stress, and grey hair when you can stay one or two steps ahead of these incidents and advance your personal development ahead of time. As a leadership coach, I engage my clients in transformative conversations. And I call them transformative conversations because these conversations have the tendency to transform their life and work experience for the better. And that is in its simplest form what my goal is for my clients. When they start working with me, they will create a gentler, kinder, more peaceful experience of their work and lives while having a greater capacity for performance. They will have more energy and enthusiasm to accomplish the desired business results while creating a fuller, richer sense of being alive. If this speaks to you, I invite you to a conversation with me to explore the areas of your leadership in work and life that are ripe to be transformed. Click here to access my calendar and schedule an exploratory, non-binding conversation.